Textiles tell stories: Let's tell yours! Whether it's a father's old work uniform, a child's outgrown clothing, or a treasured Thanksgiving tablecloth, these articles remind us of our loved ones and our most cherished memories. Instead of discarding these articles or storing them in the back of a closet, eileen can help you transform them into functional and unique quilts, pillows, or wall hangings. Working with eileen is a collaborative process combining your ideas with eileen's design experience and expertise. eileen can fashion your textiles into almost anything. It's my job to take the answers to these questions and combine them with my quilt-making and design skills generating a project plan that we're both happy with. This is a collaborative process in which I focus on the details and art of quilt-making. eileen has been sewing under her ei of the needle label for many years. First taught how to stitch by her mother while in grade school, eileen has enjoyed a life-long love affair with fabric and design, two passions she has managed to intertwine as her life’s work. What once began as a hobby enjoyed during the late hours of the night, after her husband and three daughters had gone to sleep, is now the full-time focus of eileen’s creative energy. With a background in clothing design, garment and costume construction, and accessory development, eileen’s transition into piecing and quilting occurred as a very natural step. 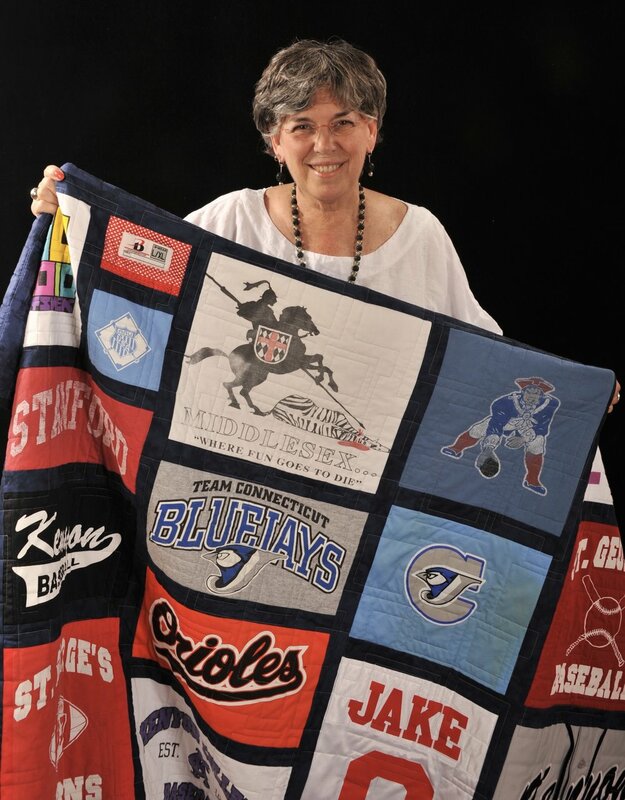 Her current areas of focus are Memory Quilts and Memory Pillows, and her work now graces homes and businesses throughout the East Coast. eileen’s love of fabric – with its infinite colors, shapes, designs, and textures – is clearly visible in her work.